There are some of us in the Yahire office that are traditionalists and believe that on Christmas Day the only option for the main course is roast turkey. There are others however that think Christmas is the time to experiment and try something a little different. 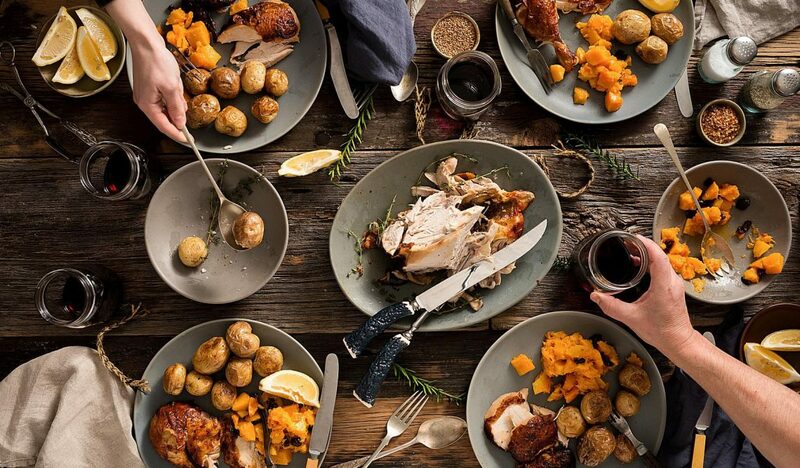 Whichever camp you fall into, if you are going to offer an alternative to the turkey, make sure it is a main course you wouldn’t normally have, something special that you can bring out and present to the table in a flourish. Pop the oven on at 210C/gas mark 7. Layer the onions, garlic and bay leaves in a roasting tray with a little oil. 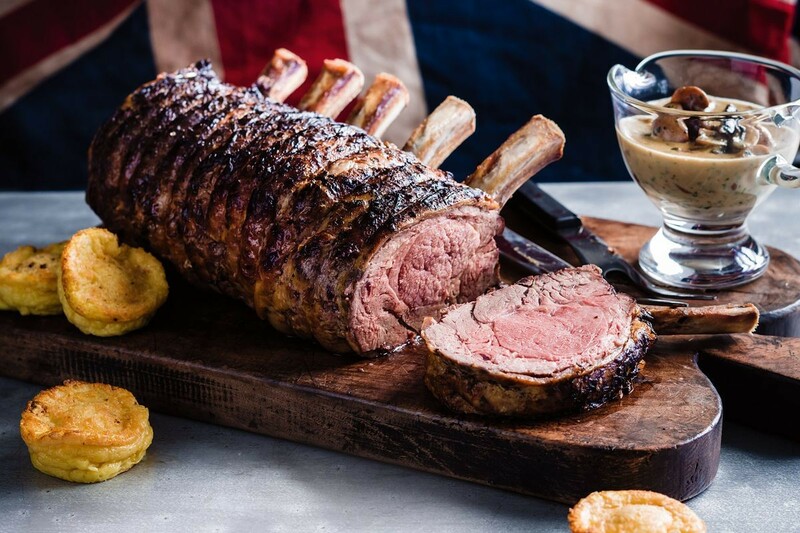 Place the rib of beef on top and drizzle with oil. Roast for 20 minutes then turn down the heat to 180C/gas mark 4 and continue roasting for a further 10 minutes per 500g. When the beef is done, take it out of the roasting tray and cover it with foil to keep it warm (it will stay warm for about half an hour). Use the juices from the tray to make a jus or gravy. Preheat the oven to 120°C/gas mark ½. 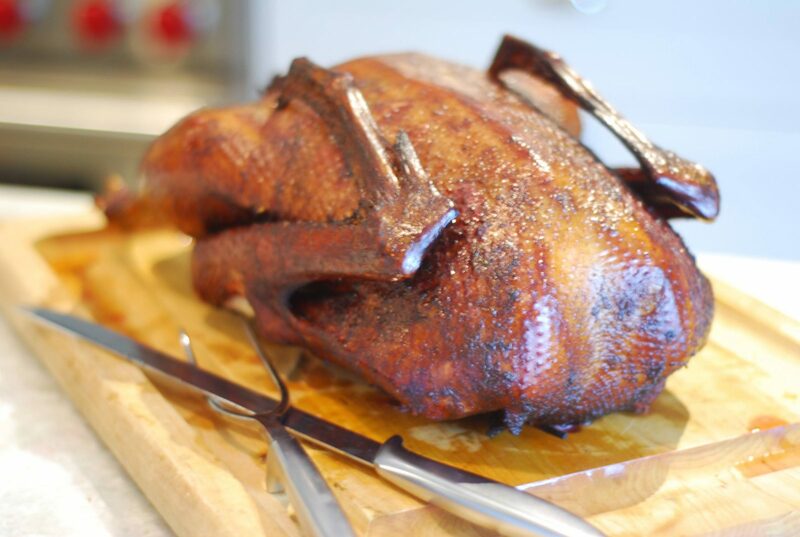 Dry the goose inside and out with kitchen paper. Mix together the apples, shallots, prunes, thyme and pepper and stuff into the goose. Rub the goose with salt, put half the cider into a roasting tray with the goose and pop into the oven. Cook for six hours making sure you baste with the cider every 30 minutes. If the cider runs out add more. After five hours start checking the goose is done by sticking a thermometer into the thickest part of the thigh (should be 80°C). When it gets to this temperature turn up the heat to 225°C/gas mark 7½ for the last 10 minutes to crisp up the skin. Leave for at least 15 minutes before carving. Heat oven to 180C/160C fan/ gas 4. 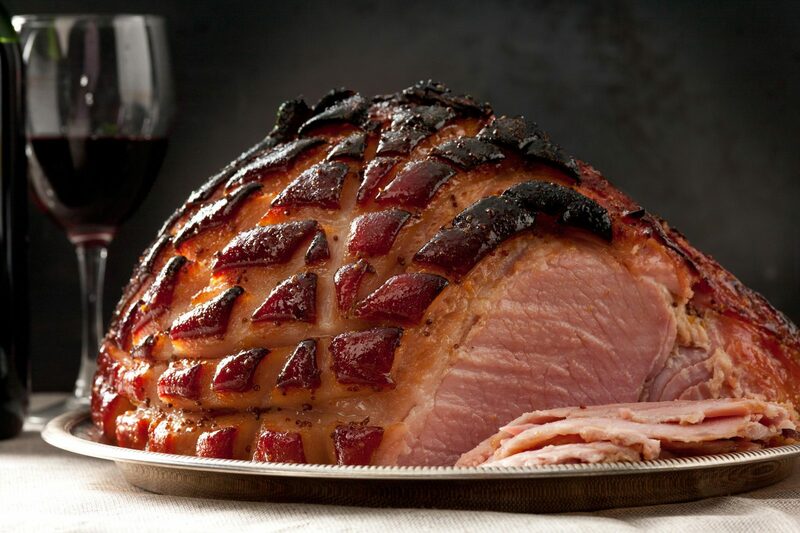 Place the ham on a wire rack in a large roasting tin that contains 480ml warm water and cover tightly with foil. Pop in the oven, turn the heat down to 160C/140C fan/gas 3 and cook for 5 hrs. In a pan, bring to boil the maple syrup, apricot jam and brown sugar with 50ml water then remove from the heat and leave to cool. After five hours remove the ham and turn up the heat to 200C/180C fan/gas 6. Remove the foil and cut off the rind, leaving as much fat on the ham as you can. Score the fat with a knife making diamond shapes and put a clove in each shape. Coat with the maple syrup mixture and put back in the oven for a further 45 mins until golden brown. Serve hot or cold. Heat oven to 180C/160C fan/gas 4. 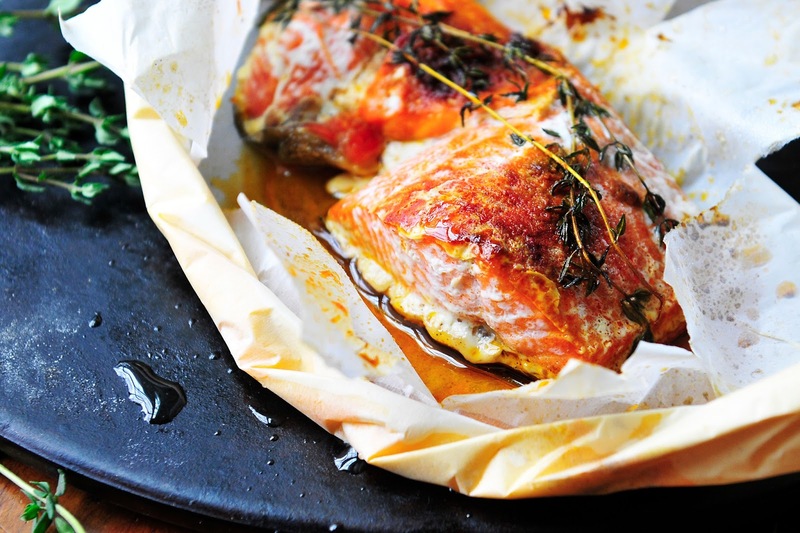 Lightly brush a large sheet of foil or parchment paper with oil and place the salmon on it with the sliced lemon on top with the fennel and dill. 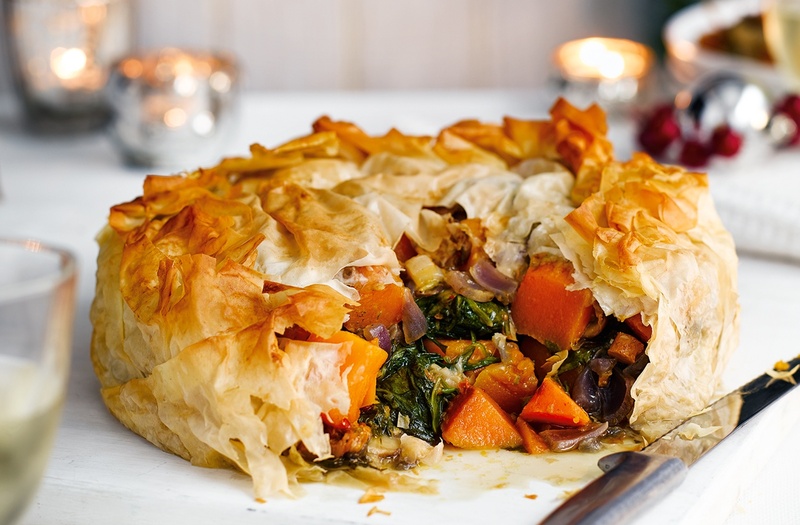 Drizzle with wine and season then top with more foil and fold up the edges loosely to make a parcel. Lift onto a large baking tray and cook for 1 hour then remove and allow to rest in the foil for 10 mins before serving. Preheat the oven to 200°C/400°F/gas mark 6. Place some greaseproof paper on an oven tray and then put the squash on it, drizzle with 1 tbsp oil, season and bake for 30 minutes. Leave to cool then mash. Brush the filo sheets with butter and line them in an oiled 9½in pie tin. Bake for 10 minutes then leave to cool. When cool push the pastry sheets apart to create a nest effect. Turn the oven down to 170°C/325°F/gas mark 3. Cook the shallots in the last of the melted butter until soft and combine with the mashed squash, chestnut purée, shallots, egg yolks, smoked paprika and seasoning. Add the chestnut pieces then beat the egg white with a pinch of salt until it forms soft peaks. Fold in gently to the squash mixture and then spoon into the filo nest and bake for about 30 minutes. When out of the oven scatter the top with pumpkin seeds. Remember that having all of the extra family members over for christmas dinner will require extra chairs and tables. If you need any chair hire or catering equipment hire for the festive period, we can help you with this.